Residential Maintenance Plans - Aliso Air, Inc.
Our preventative maintenance program for residential homes is very affordable. It ensures a long, useful life of your heating and air conditioning system, saving you money in repairs while keeping the system operating at peak efficiency all year long. We recommend the Preventative Maintenance Service be performed on an annual basis. Our competent, trained and dependable staff of experts looks after your equipment and its performance. They offer peace of mind with periodic inspections, lubricating, adjusting and cleaning of your heating and air conditioning equipment, helping to prevent potential problems before they begin. The Preventative Maintenance Service increases system reliability. Should you need emergency service, Preventative Maintenance Service entitles you to preferable treatment. As a member of Preventative Maintenance, you have a choice of programs. You set the number of Preventative Maintenance Service calls per year. This will determine the cost of your Preventative Maintenance Agreement. Prices will not be raised for following renewal periods without notifying you. 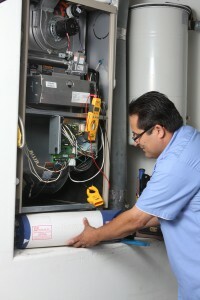 You receive free labor on normal maintenance parts installed during any scheduled Preventative Maintenance Service call. Your permission is always sought out before proceeding with any major repairs.